Mildred Bailey, 1947, New York City. Photo courtesy of the William P. Gottlieb Collection. Julia Keefe, 22, a jazz singer from Spokane, wants to correct the record on Mildred Bailey's heritage. Photo by Jessica Robinson. In the late 1930s, a sweet-voiced singer from the Northwest helped propel the nation into a new era of music, known as swing. Her name was Mildred Bailey -- sometimes called the “Rockin’ Chair Lady,” for her signature song. 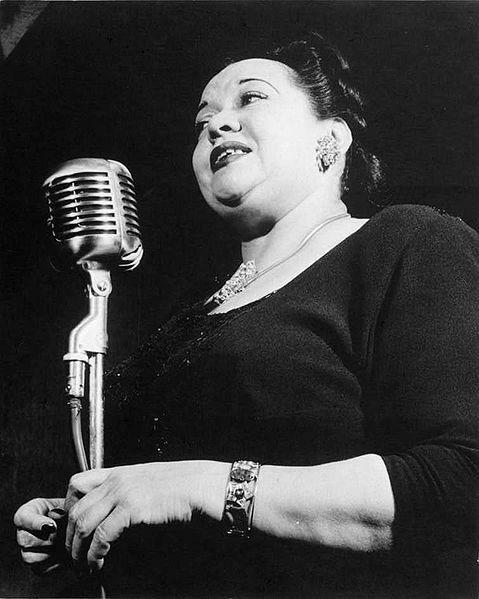 Bailey went down in history as a white vocalist who helped popularize jazz singing. Except, she wasn’t white. Bailey was half Coeur d’Alene Indian – a fact that received little attention, until recently. Correspondent Jessica Robinson has this story of two women, both named Julia, who Mildred Bailey brought together decades after her death. Julia Keefe is an aspiring singer from Spokane. Back when she was in high school, she researched her hometown’s favorite son, Bing Crosby. In the crooner’s autobiography, Keefe made a discovery. “He mentioned this woman named Mildred Bailey and how he appreciated knowing her so early in life. And it just sparked a curiosity. So I started just digging,” Keefe says. Keefe learned that Mildred Bailey had done more than inspire Bing Crosby. At the end of the Roaring Twenties, she became the first female singer with a major jazz orchestra, giving the hugely popular instrumental genre a voice. And it wasn’t just any voice. Keefe uncovered a public opinion poll in the liner notes of a Billie Holiday album. “It has Mildred Bailey, Billie Holiday, Ella Fitzgerald, one, two, three. But Mildred Bailey was at the top. She was the one to beat,” Keefe says. But Keefe, now 22, says as she got deeper into Bailey’s life, she started to notice inconsistencies in the basic facts. “Like her date of birth, where she was from, what her ethnicity was,” Keefe says. Julia Keefe is half Nez Perce Indian. So it struck a chord in her when she learned Mildred Bailey was half Coeur d’Alene. Bailey was born sometime around 1900 and spent her childhood on the Coeur d’Alene reservation in Idaho. “But I don’t think it was something she was broadcasting. I think she wanted to keep herself ethnically ambiguous,” Keefe says. “The music business was extraordinarily segregated at that time,” says Greg Yasinitsky, who teaches jazz history at Washington State University. “There were a lot of black musicians who would pass for white because the money was better and the touring schedule was better. And Mildred – certainly there would have been an advantage to being perceived as a white singer,” Yasinitsky says. Julia Keefe, meanwhile, wanted to know what Bailey was really like. And that’s what led Julia Keefe to Julia Rinker-Miller. Mildred Bailey was her aunt, her father’s sister. Julia Rinker-Miller remembers making up little dance routines for her elegant Aunt Millie in Los Angeles in the ‘40s. “I just remember her laughing so hard. Her presence was very powerful. And I found her just other-worldly,” says Rinker-Miller. Rinker-Miller had heard parts of her family’s past here and there. Childhood taunts her father received for being half Native American. Music class at Catholic school on the reservation. But for the most part, Julia Rinker-Miller saw her musician father and her Aunt Mildred through the glitzy lens of show business. Only through Julia Keefe’s questioning, did she start to think about their lives as Native Americans. “What it must have meant to be on the reservation looking out. It gives me a sense of – my God – I’m understanding who I am. Like wow!” says Rinker-Miller. In fact, she learned Mildred Bailey once credited traditional Native American singing with shaping her voice. But there’s something else that both Julias found in their search. A little-known song both acknowledge is a low point in Bailey’s repertoire. In 1938, Mildred Bailey followed a fad of singing about Native Americans in a way that most people today would find offensive. Julia Rinker-Miller says the song, “Wigwammin’” disguises Bailey’s identity in a parody of Native American clichés. “You know, this is the point, how really sad and heartbreaking it is, that people were not able to come out and wear their culture and be proud of it,” says Rinker-Miller. Julia Keefe doubts Bailey saw the song as an homage to her culture. “Of course, as a Native American woman, it was a little jarring at first, but I think it was just one of those things you had to do. You break down the walls you can. But you also had to play the game,” says Keefe. “There’re two versions of this song, there’s one that everyone usually plays. But this other song that Mildred recorded was. It’s completely different from the other version," says Keefe. Julia Keefe and Julia Rinker-Miller are now both campaigning to have Mildred Bailey inducted into the Lincoln Center’s Jazz Hall of Fame as a Native American jazz singer. Keefe says she no longer sees Bailey as a research subject. She sees her as a friend. “And maybe that’s cheesy. But it gave me the strength to look at myself as not just another girl from Spokane. Not just another jazz singer. I’m sure Mildred Bailey was called just another jazz singer too,” Keefe says. Julia Keefe keeps a picture of Mildred Bailey on her wall. When Keefe graduates with a degree in music this spring, she’ll take it with her.